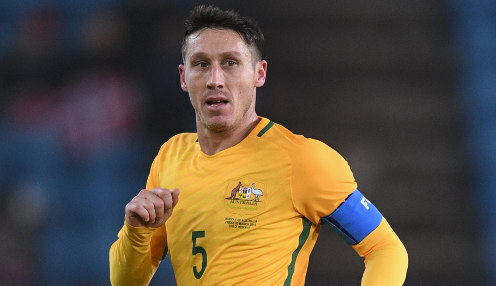 Mark Milligan is enjoying the competition for places in Australia's side at the World Cup 2018. It is his fourth experience of the tournament and, at the age of 32, is almost certainly his last, and he'll be hoping to make an impact this time. He didn't play even though he was in the squad for his first two tournaments and four years ago in Brazil he suffered a hamstring injury in the 3-1 defeat to Chile. Milligan says the injury was unfortunate but it hasn't left him feeling as though he has unfinished business. Instead, given he's been part of the international squad for 12 years now, he regards himself as being in bonus territory. "The fact that I'm still here, pushing, helping, I feel extremely proud. I've been lucky enough to play 71 games for Australia, anything that happens now is a bonus," he said. "From the beginning, it hasn't changed that much, I've had to continuously fight to be in the team." Milligan's preparations for the tournament have gone well, as he says his move to Saudi Arabian side Al Ahli worked out well for him. Speaking ahead of the Kazan clash against France on Saturday, the midfielder said the high level of competition he'd been involved in stood him in good stead. He'd been denied a move to England due to issues with visas, which he admitted had been very disappointing at the time. That left him returning for a second spell with Melbourne Victory before he signed for Al Ahli. "When the chance came to move to Saudi, it was a deal for both myself and the club," said Milligan. "Going over in January, playing so many games in the Champions League as well with them and to go through the quarters was a good experience for me and I really enjoyed it." Australia are 1/1 to win their first game against France, who are 1/4 with the draw 6/1. The Socceroos are 1/1 to win by a one-goal margin.